So many families have had to adjust to the hardships that only a war can bring. While I myself have never had to kiss my husband, father nor son goodbye to send them off to a raging battle of survival in a hardened land, it has in no way dimmed the respect I hold for the families that have. Christen called me just a few days ago asking for a last minute shoot before Jeff was to be shipped off to war. No matter how busy my life may find me, I will always make time for moments such as these. I was so proud to be a part of their day as there is much to be done before Jeff is to leave. I can never say thank you enough to the men and women who serve our country. Here are just a couple from the fun morning we had so that Jeff can see them before he heads out…and it WAS a FUN morning!! 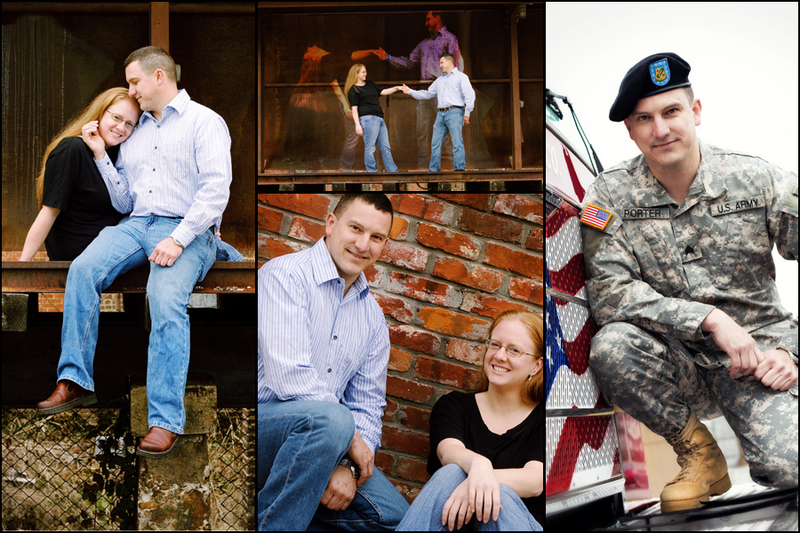 Thank you Jeff and Christen for a great morning…and thank you Jeff for risking your life for my freedom. We are looking forward to your safe homecoming! So much to say with a thousand places to start…like at the table after just 5 months of marriage when Brent informed me he was going to apply to the Pensacola fire dept. and I was sure I was going to choke on my food. Or the day I PROUDLY watched him get his badge as one of only two white firefighters hired in Pensacola in over 5 years. How about the terrible day when Brent was sent home from overtime at the firehall because another firefighter had accidentally been skipped-and the horrible call that he had been killed in a fire overnight. It could have been Brent that night. Reality check. Emotional funeral. Back to work. Lots of prayer. Then there were the lost days. The move to KS and no available work as a firefighter. Where to go and what to do. Finally we come to Cleveland. I watched as Brent came alive again back HOME as a firefighter. We are only ONE story but all firefighters have a story. It’s in their blood. It’s a special bond. And I’m proud to be the wife of a true hero. These pics are FANTASTIC!! Great job Laura!! How fun are these pictures, very special. I love all the work you do! What preciousness… I couldn’t believe, when I walked through that door this morning, how much that sweet little bundle had GROWN! And then to meet his handsome daddy and give his precious mommy a hug. What a great time I had this morning!! Here are a quick few that I promised before Thanksgiving and the crazy weekend set in! Shawn, you are truly blessed with such a wonderful family! Congratulations to you both on your engagement; I look forward to the possibility of being your photographer! In the meantime, I’ll be praying you get the building you want for your wedding to make it as special as you both deserve! It was a cold, EARLY morning shoot with my man Clay, but he was somehow able to make it look like a warm summer day, lol! We had an absolute BLAST roaming around downtown Cleveland and exploring empty buildings. We got so many crazy awesome pictures that I’m sure I’ll have to post more when I have the whole gallery done. Clay, you ROCKED these pictures…every last one of them!!! Karen, I can hardly believe the mature young lady you’ve grown to be since we first moved here just a few short years ago. I’m eager to see what God has in store for you at college and beyond. You are beautiful inside and out and I enjoyed every moment spent with you!